Orthotics, or custom insoles come in many shapes and sizes. They can be used as a preventive measure or help relieve pain or discomfort associated with an injury or congenital abnormality. At Next Step Foot & Ankle Clinic, we carry a complete line of medical grade arch supports. Drop by anytime between 9 am and 4pm to check them out. Custom orthotics, also known as custom insoles or arch supports, are specifically made to conform to your foot, thereby helping correct issues within the structure of your feet, ankles, and legs. Please check with your insurance carrier to ensure custom orthotics are a covered benefit. Custom orthotics are not a covered benefit by Medicare. While custom orthotics can help correct and prevent many of your foot and ankle ailments, research shows that some of the more effective uses of orthotics are to prevent and treat plantar fasciitis and stress fractures of the tibia (shin bone). There are many types of orthotics. 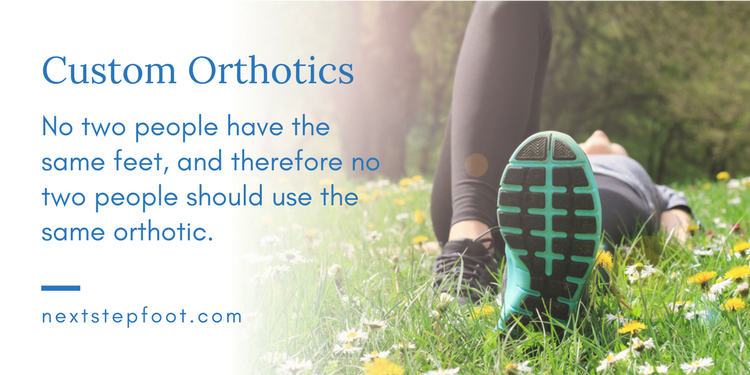 If you’re dealing with a problem such as fallen arches, there are multiple types of orthotics that could work for you. Only an experienced podiatrist and foot doctors well-trained in best use orthotic practices can help you get the correct orthotics for your problem. We currently use two different vendors for custom orthotics--one makes a cast of your foot, the other you step in foam in a box to make an impression of your foot. Just like you, your feet are unique. No two people have the same feet, and therefore no two people should use the same orthotic. At Next Step Foot & Ankle Clinic, we have the expertise to correctly diagnose your foot problem and ensure that your orthotic is right for you. Our San Antonio podiatrist delivers high-quality custom care to all of our patients, and we pride ourselves on our dedication to individualized patient care. We partner with you to determine the best possible treatment options for your unique feet, condition, and situation. To meet with a San Antonio foot doctor with the skills needed to create an effective, comfortable orthotic for you or your child, make an appointment today. When you meet with a San Antonio Podiatrist at any of our San Antonio area offices — Universal City or Pleasanton — you will be thoroughly evaluated by an experienced, compassionate podiatrist. To see what a difference the right San Antonio foot doctor makes, call 210.375.3318 today. We offer $25 Savings Certificate you can use at your first appointment. So you have flat feet -- do you need Orthotics?